Here’s our Red Wattle boar, Danny. You can see the wattle, for which the breed is named, hanging from his cheek. Nobody knows why they have wattles or what the wattles do, but this is the only breed that has them. And you’ve heard the saying, “Happy as a pig in sunshine”? 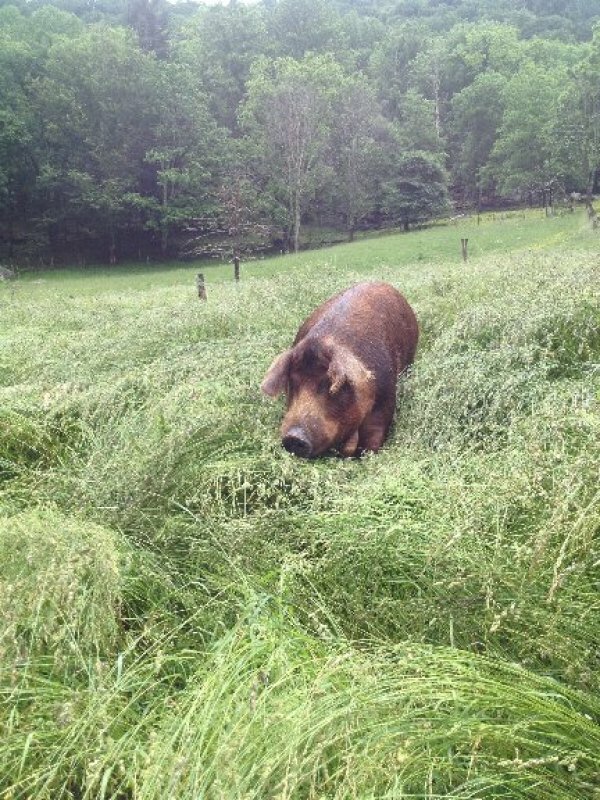 Well, Danny is happy as a pig in grass. Red Wattles flourish on pasture and can’t survive in factory conditions—that’s why the breed almost died out. Now that it’s once more popular to raise pigs on pasture, the Wattle Hog is making a big comeback. They’re wonderful pigs to raise—easy going, kind, and gentle. And that’s a good thing, because they’re big pigs. When Danny finishes growing he’s likely to be 8 feet long, 4 feet tall, and weigh 1200 pounds! ← Sheep shearing day is always an exciting event!